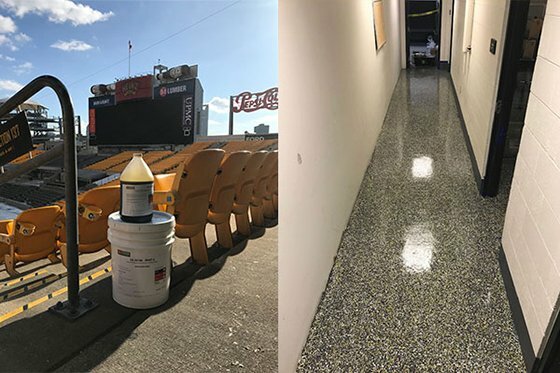 Public facilities at sports venues, including fast food areas, have some of the most heavily used floors in any commercial building and need high-performance coatings to help keep them looking good. The sheer physical foot pounding and activities such as eating by thousands of people, necessitate tough cleaning protocols that usually involve harsh cleaning products to kill bacteria. This case study concerns a major US stadium, in Pittsburgh. It opened in August 2001. The uncoated concrete flooring had reached the point where the owners wanted it brought back to a high level of attractiveness that could be maintained. In one word: age. The bare flooring was 18-years-old and the original concrete had absorbed very tough stains and grease. The client not only wanted a robust floor coating solution that would facilitate cleaning protocols without affecting the new finish, but they also wanted a VOC-free, odor-free solution with maximum robustness while still meeting strict budget limits. The choice of an effective solution was limited. Conventional floor epoxy coatings have a tendency to micro-crack under stress. Tiling can collect dirt and the grout can stain quickly. Cleaning solutions can seep down through cracks and grouting gaps weakening adhesion, so what was needed was a coating immune to physical impact, chemical stress and water while still looking attractive. Ecodur has an outstanding heritage of successful performance in the harshest of industrial applications over the past 25 years, including in thousands of oil and production water tanks, water and wastewater facilities, bridges, roofs, floors, frozen food facilities, and submerged in lagoons and containment areas. It has also coated a large area of roofing on another major US sports stadium. Ecodur is made from castor oil and naturally occurring soft rock gypsum. When cured, it is completely non-toxic and its ANSI/NSF-61 rating permits it to be in contact with human drinking water. It has zero VOCs. It also has triple the adhesion of most conventional coatings. Tests have demonstrated it regularly achieves over 100 lbs resistance in pull tests. Ecodur also permanently retains a degree of elasticity that allows it to absorb shock and substrate movement without losing any protective integrity. Its use in the fracking industry has demonstrated its high resistance to harsh chemicals and many cleaning products fall into this category. The concrete was degreased, cleaned and then dried. Ecodur 201M was manually applied with its self-leveling ability taking care of any remaining surface smoothness anomalies. Average depth was 30 mils. With winter ambient temperatures close to freezing, Ecodur was easily within the recommended application temperature range. Low-temperature applicability is a major feature of Ecodur, allowing it to be applied in winter off-season. The coated surfaces became tack-free within about 30 minutes and full cure was achieved within 24 hours. The Ecodur surface was then given a hard-wearing and decorative top coat which was mixed with black, white and Steelers’ yellow flakes and is very hard wearing. The client subsequently reported complete satisfaction with the project and especially with the ‘showroom’ finish.